The Quest for the Perfect Glove! Today, just like I stated 15 years ago, we find ourselves in the midst of a hand protection revolution. Now cut resistance has become a more paramount part of hand protection and the flat dip glove dipping process. Quite simply, flat dip technology, combined with new cut resistant fibers like aramids (including brand names Twaron®, Kevlar®) and high density polyethylene also known as HDPE (including brands like Spectra®, Tuffalene® and Dyneema®), are again revolutionizing the glove industry. Many of these cut resistant yarns double and triple cut resistance when enhanced with fiberglass or steel. New manufacturing techniques are changing the rules of the game for everybody in the hand protection business. What is flat dip technology? Where did it originate? Why is its impact so great? The following will seek to answer these questions and provide a little history of glove breakthroughs over the years, adding some needed insight and perspective to the flat dip innovation. The milestones in hand protection technology divide glove history into several neatly defined eras marked by advances in distinct areas of production. These developments are in the knitting, manufacturing, polymers and now cut resistant yarns used to make gloves. Breakthroughs were made in supported/coated gloves, polymers, high performance yarns and automated knitted gloves. Gloves could now be dipped directly to knitted gloves. No longer would general work gloves be viewed as a choice only between leather or canvas. Within this genre come breakthroughs in chemical resistant lines through formulation of superior polymers such as natural rubber, neoprene, polyvinyl chloride (PVC) and nitrile. It is here we also find the precursors to flat dip technology with palm dipping techniques and more precise manufacturing processes. With natural rubber and synthetic coatings, workers were provided improved grip and handling and unparalleled dexterity. Parallel to coated breakthroughs, were the advancements made in automated knitting. Cotton and synthetic shells and liners became lighter, tighter and more durable as automated knitting machines produced ever sturdier, highly resilient shells. Progress in all three components of glove manufacturing – knitting, manufacturing and polymers – has culminated in the advent of flat dip production. These pioneering firsts in automated knitting owe to the diligent work of Japan’s Shima Seika, Ltd. and now copied by numerous other knit machine manufacturing plants. The progress made, and cost reductions achieved, within the last 25 years outpaces the collective advancements in automated knitting 3,000 years before and since the invention of the loom. Flat dip technology is simply the precise palm coating of a polymer onto an advanced knitted cotton or synthetic shell. As the name implies, flat dip is the application of a polymer coating from the palm to the sides of the fingertips. Where it differs from other coated gloves is in the shell itself and the precision with which the coating is applied. The shell is characterized by its knitting, which produces an extremely lightweight and durable glove with a greater concentration of woven fabric per surface area. It conforms to the hand and resists degradation through stretching. The coating occurs through a careful dipping process that applies the polymer evenly over a discreet and specific area of glove. It’s the accuracy and even distribution of the coating that separates the flat dip process from other coated gloves. The result is an almost seamless coated glove that offers the wearer the comfort and feel of an unsupported, formed dipped glove with the durability and ruggedness of a knitted, coated glove. Add in cut resistant yarns used in the shells and you have the best of all worlds. Flat dipped gloves combined with glove shells utilizing cut resistant yarns or the use of cut resistant liners, have changed everything. As safety engineers and risk managers see injuries and lawsuits decline with greater usage, the trend will only continue to grow. The technology is no longer in its infancy. All good manufacturing plants have automatic dipping. Many are perfecting automation of the entire glove process. Robots and other automation now do loading, unloading, online stamping/marking, and packaging. Those who do not automate will have a hard time competing in the marketplace. Bottom line is that over capacity has driven costs to the user down drastically. Advancements in the fibers used, such as HDPE and Aramids®, to knit the shells before dipping have advanced as much as the dipping process. Adding nylon to either of these provides outstanding comfort. We see this in ladies nylons and the new athletic stretch clothing. 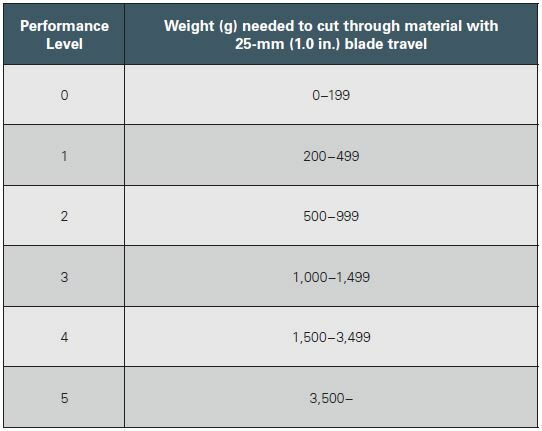 Enhancing those same fibers with steel or fiberglass drastically improve cut resistance, sometimes as much as four to five times the cut resistance. Each type of fiber has its advantage and disadvantages. Heat, wear, cut and comfort all vary with the type of base fiber and what is added to it making up the final yarn. Even some of the industrial polyesters have good cut qualities when enhanced and wrapped correctly, at lower cost. Add in more capacity and competitors HDPE and Aramid® markets, and you see costs greatly reduced. Improved wrapping processes have also improved cut resistance and comfort. It’s the actual applications that highlight the universal appeal of flat dipped gloves. From general construction to automotive, assembly, material handling and repair, the glove’s comfort and grip make it a favorite of workers in nearly every industry. And because of the precision in its knitting and the possibilities available with its coatings, flat dipped gloves are fast becoming the premier of choice for electronics and computer assembly. The retail market, which typically lags behind in glove innovation, has now exploded with the flat dipped products. The cut resistant yarns are now starting to show up in the retail marketplace, specifically in the do-it-yourself and home improvement stores. And as we’ve learned in this business, what a worker wears on the job is what he or she typically wants when working at home. Perfect glove? We are getting pretty close!!! Craig Wagner can be reached at craig.wagner@globalglove.com or by calling 763-450-0110. Global Glove is a privately held glove maker headquartered in Ramsey, Minnesota. In addition to speaking and writing extensively about the hand protection market, Mr. Wagner is a frequent lecturer at on-site safety and quality assurance seminars for industrial workers across the country and around the world and has 30 years of sales and manufacturing experience in the glove market. Glove Coatings & Materials – What is right for you? Article written with information courtesy of Wells Lamont, Liberty Glove & Safety, Majestic and Cordova Safety Products. Determining the appropriate type of glove, coating or features is vital to ensuring the protection of you and your co-workers. What type of leather will provide the most abrasion resistance but not break the bank? Will a latex or Nitrile glove be better for use in oily applications? I need level 4 cut protection; what’s the best material for this cut level requirement? Below is some information about a variety of glove components and some of their characteristics. As always, it is recommended that you first test out the glove options you are considering to make sure that they will meet your specific job’s requirements. NITRILE – An alternative to latex, nitrile offers superior resistance to snags, punctures, abrasions and cuts. Coated nitrile effectively replaces and outwears leathers in a broad range of dry and light wet/oily applications. In most cases, nitrile dipped gloves are machine washable. VINYL/PVC – Also known as PVC (polyvinyl chloride) it is available in disposable, coated or vinyl impregnated styles. In addition to offering excellent sensitivity, vinyl/PVC disposable gloves are chemical resistant and ambidextrous. Vinyl/PVC coated is an inexpensive choice for applications where cut and abrasion resistance is needed. Rough PVC coatings make handling wet surfaces easier and safer. Vinyl/PVC impregnated gloves on an interlock knit liner stretch to a snug and sensitive fit, are liquid repellent and provide superior grip. LATEX – Offers superior strength, dexterity, and both liquid and chemical resistant protection in disposable styles. Coated rubber is a great choice for additional cut resistance, comfort and value. For a versatile solution, latex coated options are an ideal choice for abrasion resistance such as for handling sharp edges or building materials like concrete block, tile or lumber. POLYURETHANE (PU) – Mainly used as a coating in knit gloves, PU offers great dexterity, softness and strength with a comfortable fit. Resistant to oils, solvents, greases, gasoline and more it also contains no latex proteins or chemical accelerators, both of which can cause allergic reactions. Many polyurethane coated gloves offer good protection from minor cuts and scrapes. KEVLAR® – One of the strongest man-made fibers available, Kevlar® offers excellent cut protection and heat insulation; Kevlar® gloves are flame resistant so they will not burn or melt, and can protect against temperatures up to 700° F. It is designed to protect hands from the sharp edges of metals, ceramics, glass and other materials. Pound for pound Kevlar® is five times stronger than stainless steel. TAEKI5® – Developed in Europe, this versatile multi-filament yarn combines high strength Taeki® fiber, fiberglass and synthetic fiber to provide excellent abrasion, cut and contact heat resistance. The high cut- and abrasion-resistant properties give it an outstanding performance-to-price ratio. In addition, Taeki5® is launderable (minimal shrinking) and is unaffected by chlorine bleach and exposure to UV light, thereby extending glove life. ALYCORETM – Patented AlycoreTM offers cut, puncture and needle resistance like no other product has before. Composed mostly of super-thin threads of iron and carbon, AlycoreTM is lightweight, flexible, breathable, recyclable and washable. It provides over six pounds of cut resistance and is tested using actual 25-gauge needles, which break when impacted with an AlycoreTM glove. COWHIDE LEATHER – Offers good abrasion resistance, an attractive appearance and good thermal protection. It is the most commonly used leather in the glove market and is generally the most cost-effective available. PIGSKIN LEATHER – Offers the greatest breathability due to larger pores in the hide and is flexible even after repeated exposure to moisture; it also will not shrink when dried. Pigskin leather offers the highest resistance to heat and abrasion and has good tensile strength. GOATSKIN LEATHER – When tactile sensitivity is required, goatskin leather is the ideal option. It is soft, pliable, provides excellent wear, abrasion resistance and tensile strength. Goatskin leather, due to its high lanolin content, is one of the softest leathers available. SYNTHETIC LEATHER – A man-made fabric that looks like leather, it is used for basic protection against abrasion and offers good insulation depending on construction. Often used as a substitute for real leather, it is light-weight and easy to clean, durable and stain resistant. Take a moment and consider this familiar scenario; You have been presented with two glove options for your workforce of about one hundred employees. Glove option one features durable construction using a top grain leather with minimal dexterity and cut resistance, comes from a trusted glove manufacturer and costs only $8 per pair. Option B features a nitrile dipped Kevlar® shell for excellent cut resistance, superior dexterity and durability, good wet and dry grip and it can be laundered for extended use but is $12 per pair. Simple math says to go with option one, right? If you purchase just one pair per employee, your cost difference alone is $400 less. But what about the factors other than just cost? As a Safety Manager, your focus is to find the best option for the task at hand while considering a variety of important factors. A 2013 study* from TriComB2B in partnership with the University of Dayton School of Business found that price dominated just 55% of all purchasing decisions. Instead, product features, benefits and even brand name are other attributes that are factored in on buying decisions. We no longer live and work in a cost-driven world. Instead, Safety Managers are looking for gloves that are dexterous, coated for an enhanced grip, and made with materials that are inherently cut resistant, in addition to other features, in an effort to increase worker safety. While cut resistance is an obvious component of elevated protection, the other two aspects should not be overlooked either. A glove that lacks dexterity may be removed to perform certain tasks, which removes the worker’s protection. An enhanced grip makes it less likely something will slip out of, or through the worker’s hands, which could cause a laceration. There are multiple variables to take into account for each job or task to ensure the overall protection meets workers’ needs. So let’s look at some of these additional factors that one may want to consider prior to making a purchasing decision. You may be asking “But aren’t these cut resistant gloves much more expensive than general purpose gloves?” Until very recently, that was the case. However, advancements in manufacturing processes and engineered yarn technology has allowed glove manufacturers to narrow this pricing gap dramatically. Engineered yarns optimize performance, function, and protection by blending select fibers to exceed industry standards. The ultimate objective has always been affordable cut resistant gloves for practically every application and now it can be provided for everyone, in every market. Previously, construction workers were typically seen wearing those fabric/leather split palm gloves. However switching to coated seamless knits with engineered yarns enhances protection and allows workers to more securely hold power tools, handle sharp fasteners and sheet metal. Warehouse workers who often wear the economical general purpose gloves can now be more secure, even while handling those dangerous box cutters or razor sharp tape dispenser blades. With coated dipped gloves, workers can now keep their gloves on while performing all job tasks opposed to having to remove bulkier gloves to perform a task that requires more dexterity than they can get from their current glove. By removing their gloves, workers are put at greater risk of injury. Over time the CoO of leather is higher than using any other glove tested. Leather offers less protection and performance than synthetic options. The most expensive glove to wear based on the CoO is top grain leather…the test results illustrate 3 ½ times more costly than nitrile foam, seven times more than latex flat dipped and 11 times more than the CoO of coated Dyneema®. The least expensive glove to wear based on the CoO is Dyneema®. The tested glove1 offers abrasion resistance that is 160 times that of a regular grade top grain leather glove. The tested splash latex coated knit glove2 was found to be one third of the CoO of an economy split leather palm glove and offers almost twice the wear. The tested crinkle finish latex coated knit3 offers 30% more protection from abrasion than a “B/C” grade split leather palm and costs only 25% more than the leather glove. This same glove also offers abrasion resistance that is three times that of a regular grade leather drivers and it is seven times more cost effective to own. The tested economy crinkle finish latex coated knit4 provided almost twice the wear of the regular grade top grain leather glove and is eight times more cost effective to own. The tested foam nitrile coated nylon knit5 will provide almost six times the wear of the “B/C” grade split leather palm and it is almost three time more cost effective to own. This same glove offers approximately three times more abrasion resistance than regular grade leather drivers while CoO of leather is over five times higher. Another factor to consider is whether the gloves you are considering can be worn on either hand or machined wash. By having the capability to be worn on either the left or right hand, wearers have essentially doubled the life of the glove. Some machined knit gloves also feature the benefit of being able to be machined washed. This enables many of the contaminants the gloves have picked up during use, whether dirt and debris, chemicals, or other types of foreign particles, to be washed from the gloves and returned back to near-new characteristics. In either case, factoring in these life-extending capabilities should be factored into your overall glove costs. (Two items of note: 1) If you or your employees are washing the gloves, or you have an outside laundering company handling this, additional fees for laundering, should be considered and 2) Some gloves will lose certain benefits and characteristics with each wash. Please refer to the glove manufacturer for washing limits and instructions on care, and be sure to inspect your gloves after each wash cycle, ensuring they will provide the same level of protection as when first used). Launderability of a glove and whether it is ambidextrous or not can also become a factor for those companies who attempt to minimize waste. By adding life to the gloves via machine/hand washing or the simple switching the glove from left to right hand usage, companies can help minimize their waste footprint as well. The true costs of a glove are going to vary from company to company and even person to person. Some companies, even if they are in the same type of industry, will cycle through gloves at different rates for a variety of reasons. From different weather environments and worksite requirements to the pride employees take in their safety gear and unaccounted for usage, you should always conduct a site survey that is specific to your company’s requirements prior to deciding on a glove purchase. Having a good understanding of the requirements and demands your work and employees will be putting on their hand protection will help you determine which the best options will be. Most suppliers, including Ritz Safety, are happy to provide these site surveys either on their own or with the partnership of a trusted glove manufacturer. In many cases, bringing in a representative of the glove or gloves you are considering, will also help you better understand the best options, as they may see things that could require a different type of glove feature or style. So when the time comes to make a decision on the hand protection for your workforce, be sure that you are looking at the many other factors presented with the purchase and not simply cost alone. As companies continue attempting to keep costs low and get the most out of every purchase, sometimes higher up-front costs will actually lead to lower overall costs in the end. Taking time to properly assess all the factors related to your glove needs will help you determine the true costs of that $8 or $12 glove purchase. **Glove models utilized during testing: 1) PIP 19-D622. 2) PIP 39-C122. 3) PIP 39-C1300. 4) PIP 39-1310. 5) PIP 34-800. Ritz Safety, an international distributor for a broad range of personal protective equipment, opened it’s doors in 1983. With nine locations throughout the United States, Ritz Safety has a location near you, with 24/7 ordering capabilities also available at www.RitzSafety.com. Please contact us directly at (800) 451-3077 or Sales@RitzSafety.com with questions or to place an order. Additional article information was provided by Protective Industrial Products, one of Ritz Safety’s key partners in providing cutting-edge safety equipment. PIP has been an independently owned supplier of consumable personal protective equipment to industrial distribution for over 30 years. Workers and employers seeking cut resistant gloves in today’s marketplace have more options than ever before. From traditional leather and knit cut resistant fabrics, to more advanced, lightweight coated options, picking the right glove for the job is a daunting task! Cut resistance levels can add another layer of confusion to the mix, as different measurement standards are used or cited by different manufacturers. With all this complexity, how do you find the glove YOU need? Our friends at DuPont® (makers of Kevlar® brand cut resistant fabric) have put together a useful guide for understanding the ins and outs of cutting-edge cut resistance. The full guide is linked at the bottom of this article. The first thing to consider in choosing a cut resistant glove is the Cut Level. But, three different standards exist, and they are not interchangeable. These methods both use a straight-edge blade under load to cut a sample. The sample is cut five times each at three different loads, to determine the required load to cut through the sample at a reference distance of 20mm. This is an updated and more accurate testing method, which improved on the results found using the old ASTM F1790 test. As a result of this more stringent testing, material tested under the new standard will typically achieve a lower cut resistance rating than in previous tests with the old method. The EN 388 test method uses a circular blade under a fixed load. The blade moves back and forth across the sample until it is cut through. The cut resistance is measured as a ratio of the number of cycles needed to cut through the test sample vs. a reference material. All test methods assign a Performance Level from 0 – 5 to each glove. These levels give a good general idea of the performance of a glove, but the actual performance values should be used when comparing two products. In addition, ASTM and EN 388 cut levels are NOT interchangeable. See the charts below for details on how the cut levels break down. The Gloves category on our website now allows you to filter results by ANSI or EN cut levels. If you’re looking for more information, or need some help comparing different glove options, contact one of our experienced account representatives. 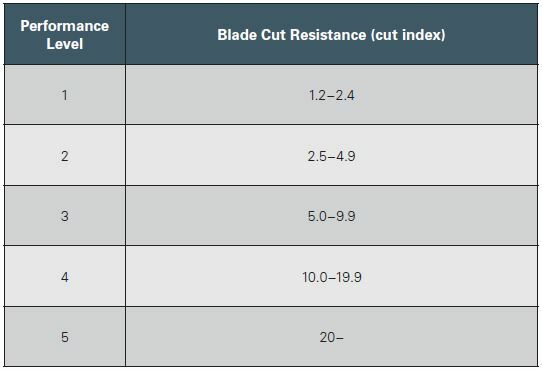 For more information about cut resistance testing, check out this comprehensive guide from DuPont®. With all the news coverage of the Ebola scare in recent weeks, many workplaces and individuals are wondering how and if they should prepare for this new threat. In part one of a 3-part series, we will hear from Donna Wishart, a CPR/First Aid/AED trainer we have partnered with in the Tampa area. Donna addresses the importance of bloodborne pathogen training, and why it should be an integral part of your workforce training regimen. She also talks about the greatest risk for bloodborne pathogen exposure, and it might not be what you think! Exposure to Bloodborne Pathogens could happen on any school campus, office environment, construction site … at any time, and on any given day. Consider for a moment how often school teachers encounter students that have suffered a bloody nose during class. Or how frequently employees sustain cuts, scrapes, or even bleeding injuries. Also, staff becoming ill and vomiting at work. It may not be the most glamorous part of an employee’s job, but it’s vital that staff learn and understand how to properly handle bloodborne pathogen exposures to aid others while protecting themselves. Bloodborne pathogen exposure training is one of the most crucial parts of a staff member’s job, which is why it’s an annual safety-training requirement for most employees across the country. Bloodborne pathogens, which are commonly referred to as “BBPs,” can be bacterial (i.e. staph or strep) or viral (i.e. flu, colds, hepatitis A, B, or C, Ebola and HIV). BBPs are present in blood and other body fluids, and can be transmitted when blood or body fluids from a contaminated person enters another person’s body through cuts, abrasions, or body cavities (such as the mouth, eyes, or nose). According to the Centers for Disease Control and Prevention (CDC), there are 300,000 new cases of BBP exposure reported each year, but the greatest risk to personnel is from the hepatitis B virus. It is particularly crucial to focus on protection and prevention in regards to hepatitis B, because the signs and symptoms of the virus may not manifest for a long time – often weeks or months. Hepatitis B can cause liver inflammation, vomiting, jaundice and sometimes even death. Chronic hepatitis B may eventually cause liver cirrhosis and liver cancer, a fatal disease with very poor response to current chemotherapy treatment. The CDC also estimates there are three million people currently infected with hepatitis C and most of them don’t even know it yet! That is why it is essential for staff to be educated and diligent in protecting themselves from any BBP exposure. 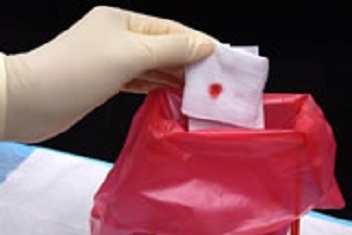 No matter the position and its particular duties, the risk of encountering an accident involving bodily fluids on the job, such as blood, is always present for most employees. Any human body fluid containing blood can carry BBPs. A key prevention strategy is to always exercise universal precautions – a series of precautionary measures designed to prevent against the transmission of bloodborne pathogens. One example of universal precautions would be the use of personal protective equipment (PPE), such as disposable gloves, masks, gowns when handling blood or other body fluids. Donna Wishart is the owner of Wishart Safety Training, Inc., a local partner with Ritz Safety in the Tampa, FL area. Wishart Safety Training currently offers nationally accredited Bloodborne Pathogens training courses for all types of organizations. The course is designed to teach employees how to avoid accidental exposures and how to manage an accidental exposure if one occurs. They issue a two year certification card upon completion of the class. Be sure to check out part two of this series, for some information about how Ebola spreads, and how to stay safe. How Serious is the Risk from Ebola? With all the news coverage of the Ebola scare in recent weeks, many workplaces and individuals are wondering how and if they should prepare for this new threat. In part two of a 3-part series, we look at some facts and figures about Ebola. How is the disease spread, and how quickly? What are some practical steps YOU can take to minimize the risk of exposure? Read on to find out! Ebola is not spread through casual contact; therefore, the risk of an outbreak in the U.S. is very low. The CDC goes on to say that the United States public health systems are well prepared to deal with isolated instances of Ebola. Various studies have been conducted on Ebola, and most experts agree a typical patient will only infect 1-2 other individuals with the virus. Compared to other viral diseases, such as Influenza, that is a fairly low number. So why has the outbreak of Ebola sparked such a scare? Unlike other infectious diseases like Influenza, the death rate for those infected with Ebola is very high (reports vary anywhere from 50% to 90%). The question remains then, how serious is the threat of Ebola, and how can a workplace protect against it? Ebola is spread through blood and other body fluids. In addition, a person is not contagious until they have begun to exhibit symptoms. Normal precautions should be followed when around someone who has signs of sickness, including proper hand-washing and avoiding contact with body fluids. In the workplace, it is important to have PPE such as disposable gloves and masks available, so that workers don’t put themselves at risk while trying to help others. Seek medical care immediately if you develop fever (temperature of 100.4°F/ 38.0°C) and any of the other following symptoms: headache, muscle pain, diarrhea, vomiting, stomach pain, or unexplained bruising or bleeding. For more tips from the CDC, check out this webpage. It is frequently updated as the CDC tracks the spread of Ebola in the US. In the final part of our 3-part series, we discuss how to safely put on and take off PPE to avoid contamination. Check it out here! With all the news coverage of the Ebola scare in recent weeks, many workplaces and individuals are wondering how and if they should prepare for this new threat. 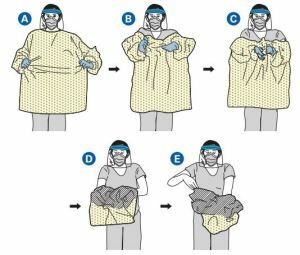 In part three of a 3-part series, we talk about how to put on and take off personal protective equipment to avoid contamination. These tips are important for any workers who deal with hazardous materials – from bloodborne pathogens to industrial solvents. Your PPE is designed to protect you before, during and after exposure, if used properly. Proper PPE removal is crucial to avoid contamination. Even with the best gear, a worker can easily become contaminated if they are not careful to remove items safely. And, while the Ebola news has many worrying about these issues right now, the risk of contamination exists in many workplaces. Keep your workers safe by making sure they follow proper donning and doffing techniques. Workers who deal with hazardous chemicals, high levels of heat or molten materials, or health hazards such as bloodborne pathogens certainly realize they are at risk while in the presence of the hazard. But the natural tendency is to relax once the initial danger is no longer present. It is during the removal of safety equipment, when the actual hazard is no longer obvious, that workers may let down their guard, and accidentally expose themselves to risk. The most important thing to remember when removing PPE is to avoid touching contaminated surfaces with bare skin. Gloves, coveralls, hard hats, masks and goggles should all be treated as contaminated, and should be removed from the inside-out whenever possible. In the case of disposable gloves and coveralls, this allows the contaminated surface to be folded in on itself for safe disposal. 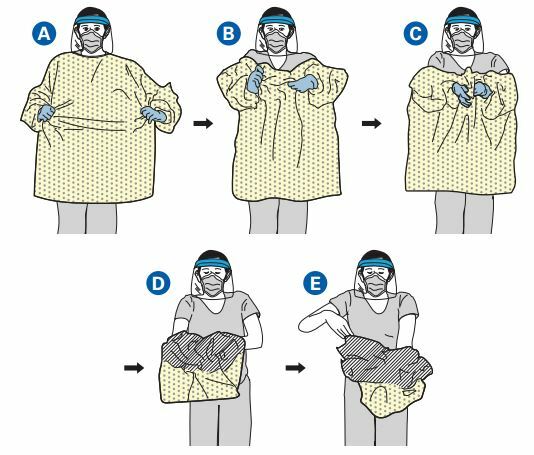 For more information, check out this poster from the CDC, detailing the proper way to wear PPE to avoid medical contamination, and two methods for safely removing gear. Working with chemicals? Make sure you’ve got the right gloves for the job. Working with chemicals presents a unique risk, and requires careful selection of safety equipment. The wrong glove or coveralls might appear to be working for a time, but suddenly fail with little to no warning. For this reason, it is essential that workers who are exposed to chemical hazards be outfitted with the right gear. 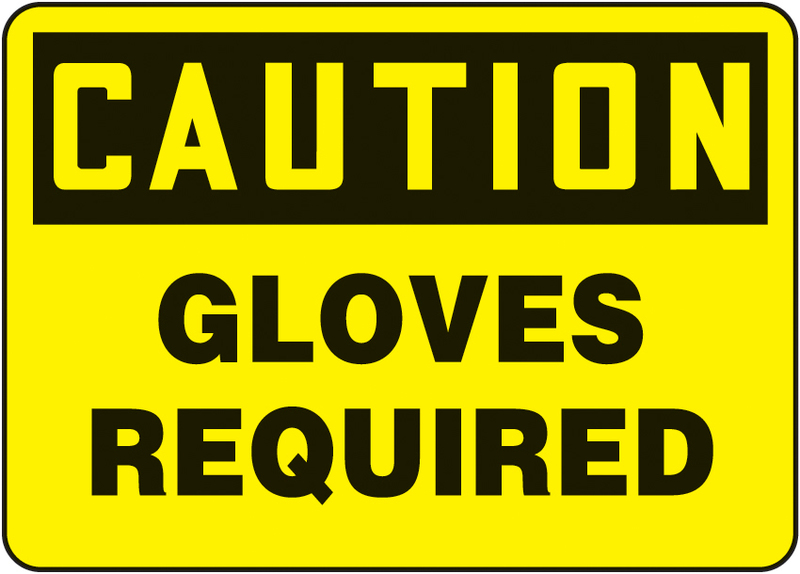 Remember – all gloves and coveralls will degrade over time. It is essential to monitor and maintain the condition of your PPE, and replace it before a failure. Properly sizing your equipment can also help it to last longer and be more effective (check out our handy glove sizing chart!). 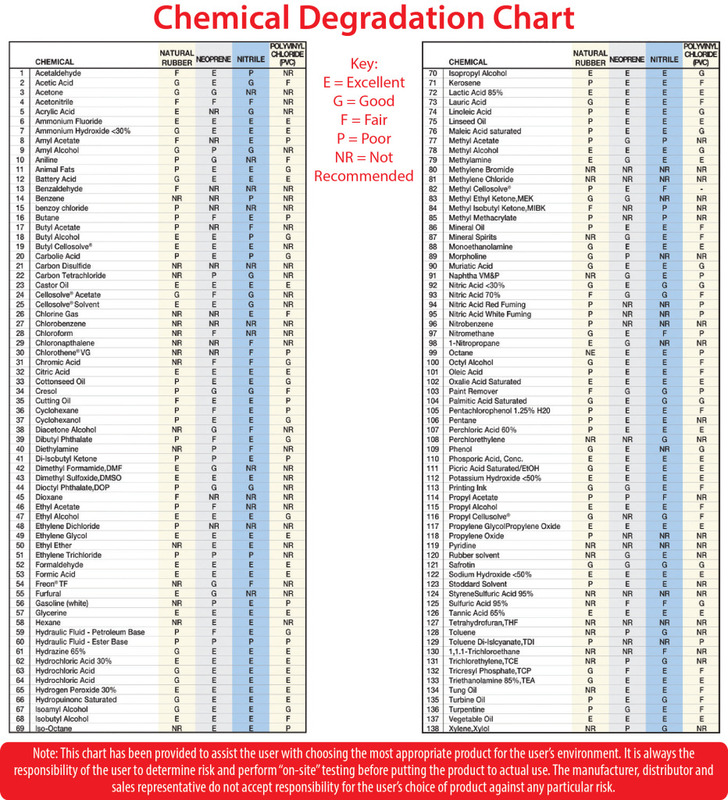 Note: This chart has been provided to assist the user with choosing the most appropriate product for the user’s environment. It is always the responsibility of the user to determine risk and perform “on-site” testing before putting the product to actual use. The manufacturer, distributor and sales representative do not accept responsibility for the user’s choice of product against any particular risk. Are you ordering the right glove size? Choosing the correct glove sizes for yourself and your workers can often be a guessing game. How can you be sure you’re buying the correct sizes, and avoid ending up with extra inventory? 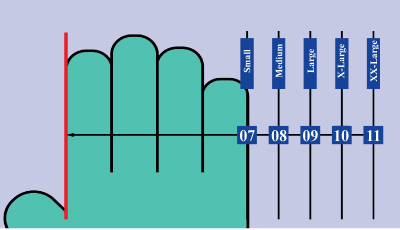 Thankfully, Ritz Safety has a handy sizing chart which will take most of the guesswork out of glove sizing! To use the chart, just click the image below to open the PDF file, and print it. Be sure when you print, you choose to print at “actual size.” Then, follow the instructions on the sheet to determine approximate glove size. Have an employee who’s hands fall between two sizes? It’s usually best to go with the larger option. Remember – different glove styles fit differently. For instance, you might want a snug fit from a disposable latex glove, but prefer a bit more room in a leather palm glove. Gloves with insulated liners also tend to fit a little bit tighter, so many customers prefer to buy a larger size. 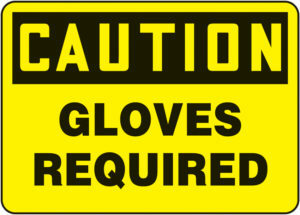 If you’re still not sure what size gloves you should order, give us a call at 1-800-451-3077!